The Stray Cats were a huge influence on the burgeoning rockabilly scene of the early 1980s, and that influence can still be felt today in numerous bands who continue to emulate what they brought to the party. 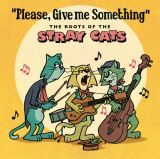 This 28-tracker, however, looks at the music that influenced The Stray Cats. 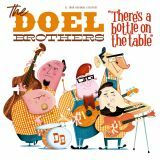 Primarily it\'s a collection of songs they covered in the first dozen or so years of their existence, and to that end is little more than an excuse for a wonderful collection of familiar pre-1960 gems. Most of it is rockabilly but a few r&b / straight rock n roll ditties are scattered about here and there to complete the picture. The band were notorious for \'borrowing\' old songs to which they added new lyrics and sometimes altered arrangements, slapping a new title on \'em in the process. Hence Lew Williams\' \'Bop Bop A Doo Bop\' became \'Fishnet Stockings\', The Wheels\' \'Let\'s Have A Ball\' became \'Gonna Ball\', Bill Allen\'s \'Please Give Me Something\' became \'Crawl Up And Die\' and so forth. In the case of \'Stray Cat Strut\', they plundered both The Nomads\' \'Icky Poo\' and Lonesome Lee\'s \'Lonely Travelin\". Brian Setzer, the band\'s main songwriter, has never hidden the fact that he did such things but, whether you liked them or not, The Stray Cats certainly brought some much needed excitement to the turgid mainstream music scene of the early 1980s. Needless to say, there\'s some marvellous stuff here - lots of cream that stray cats, hep cats and even flea-ridden moggies will find just purrrrfect (ouch! ).